The graphics in this package come in transparent GIF format. You don't need any special software, just add them to your site like you would any other images. With this package you will also get the source PSD files for these graphics. To work with these source files you'll need Adobe Photoshop, Photoshop Elements or Adobe Image Ready (which comes with Photoshop). You don't need Photoshop for the GIF files, but you do for these source files. 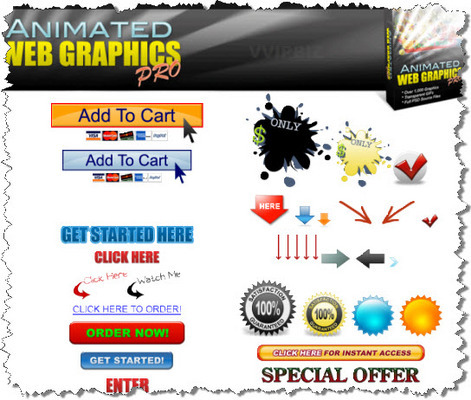 Brand New Package Of Over 1,000 Top Quality Animated Web Graphics! They were all designed by a real graphics pro who charges up to $100 an hour for custom work. This is really high quality stuff. So you can actually feel good about putting these graphics on your site. This package consists of 2 parts: 1) Transparent GIF files, and 2) Source PSD files. For the transparent GIF files you don't need any special software. Just add them to your site like you would any other images. And since they're "transparent GIFs" they can be used on any color background (white, black, yellow, whatever). These GIF files come in different styles, colors and sizes. You will also get different wording for the "call to action" buttons and text like: "Order Now", "Join Now", "Add To Cart", "Click Here", etc.. Most graphics come with 10 or more variations. So you get tons of variety. And in case you want even more variety, you also get full source files to all of these graphics. So you can change the colors, styles, sizes, text, animation speeds, etc.. Everything is customizable, so you can create your own unique variations of these graphics to suit your needs. And, it's super easy to customize these graphics. All of the animations and layers are in place, so you just have to change one or two lines of text, or add a new style to a button, and the whole graphic and all the layers get updated automatically. It literally takes just a few seconds or minutes. So you can easily create hundreds or thousands more variations of these graphics. This is a very easy to use and highly customizable package. If you want you can just stick these graphics into your websites, as is. They're already formatted and ready to go. Or if you want, you can play around with the source files and create your own unique variations to perfectly suit your own needs.